About an hour outskirt of the city lays this UNESCO-listed heritage site. Founded in 1350, the city is the second capital of Siamese after Sukhothai. Lively with trade, the city is one of the world's most cosmopolitan metropolises that welcome diplomats who have flown in from far nations of the world. 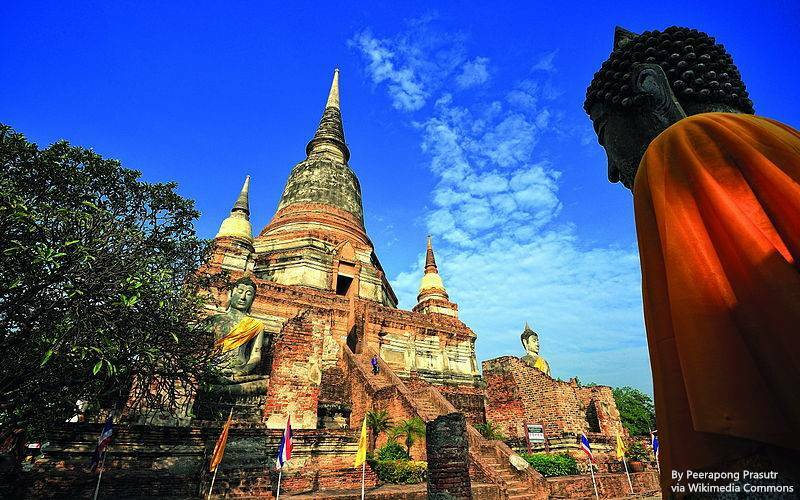 Ayutthaya has many things to offer these days more than just a mesmerizing slice of Siamese past. It is straightforward to get to Ayutthaya from Bangkok, and the historic square is quite magnificent no wonder that UNESCO named it as one of world's heritage site. UME Travel advisors have prepared a list of vital tips that will be needed for your first visit. Religiously follow this mini guide, and you will perfectly fit in! Luck enough, Ayutthaya is just approximately 85 kilometres (52 miles) away from Bangkok which you can cover within one day by train. Alternatively, you can reach the city by bus, car, minivan, boat, or motorbike! For me, the train trip did it because it is faster and quite comfortable! All trains traveling to other parts of Thailand from Bangkok start their journey from Hua Lamphong Station. Regular trains ply Ayutthaya making it very easy for tourists to enter and exit whenever they like. It is advisable to buy 8:30AM-ticket to afford you adequate time for a one-day trip to Ayutthaya. It takes less than 11/2 hours to reach to Ayutthaya from Bangkok with the train ticket starting from 15 Baht ($0.44) for 3rd class tickets. Bike hire is extensively available in Ayutthaya. All hotels and guest houses have a couple of them for their customers who choose not to trek around the city, or you can end up in shops, bars, agency and cafes that offer bike rental. The bike tour is only advisable if you decide to space your day as you desired and loved taking pictures. However, I have a full understanding of how painful it is to have others to wait for m whenever I see a beautiful view I want to capture with my camera. Taking photography in a group tour is occasionally a shoot-and-go affair f you don't; want to slow down the itinerary of your team. You can as well go on a long bicycle ride to far distance. But to do this, you must understand your body, have the energy, and above all, know how to fix bike problems if the need arises for that. Assistance is such an important thing on such bike tour. It is up to you and your experience otherwise. You can cover most parts of the city with your bike while you have a great time too. Don't forget to download the map of the area to explore the secondary roads. You have two options from Ayutthaya train station; either to take tuk-tuk or bike route. If you pick the former, you have many options with a daily fare of between 400 – 500 Baht. Like me for instance, the majority of my favourite tuk-tuk drivers usually request for 500 – 700 Baht for 4 hours trip, so it depends on your bargaining power. Another available option is to bike rental. There's a motorcycle/bike station just across the train station where you can hire either of the two for around 150 Bath for a motorcycle or 50 Bath for a small bicycle. You as well get a mountain bike for a fee of 100 Bath for 24 hours. I chose the bike route because of its affordability over other options and because I want to explore most of Ayutthaya at my own pace. Though a majority of the tuk-tuk drivers have their usual route, you can request to be taken through another path. If you are moving around the city by bike, Wat Phra Ram is the best starting point before jumping into another temple. The starting point is the Wat Yai Chaimongkol temple because of its proximity to the train station. King U-Thong built the site for monks who had returned from Ceylon after studying under Phra Vanarat Maha Thera in 1357 A.D. The complex comprises of several temples and Buddha effigies. I admired the rows of Buddha statues wearing golden clothing around the central stupa. On top of that is another a giant reclining Buddha also dressed in gold. 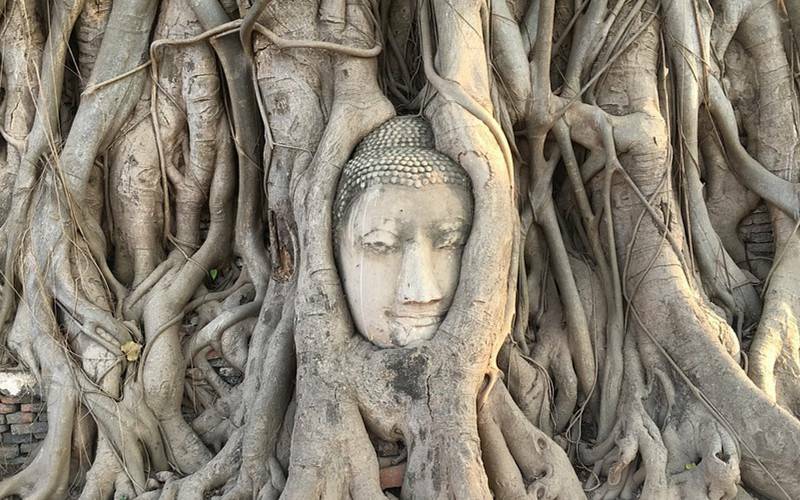 Next is the Wat Mahathat; home to one of Thailand's most iconic images - a Buddha head intertwined inside the roots of a tree. The complexity of Wat Mahathat is enormous and can be puzzling to find your way around it. Despite that fact the more substantial part of the place lie in ruins, it still a captivating place to stopover and to take photographs. Due to the big size of the temple area, you will habitually find yourself completely alone allowing for exquisite selfies. Another thing I love about the place is the countless number of local artists sitting on the grass painting the temple. Since Wat Mahathat is situated almost right in the centre of Ayutthaya, it's a fabulous area to travel around on foot. Next to the temple complex is a large garden known as Rama Public Park. It is filled with other temples, ruins and a lot of amusing and cold spots in the shade to unwind and get out of the heat. 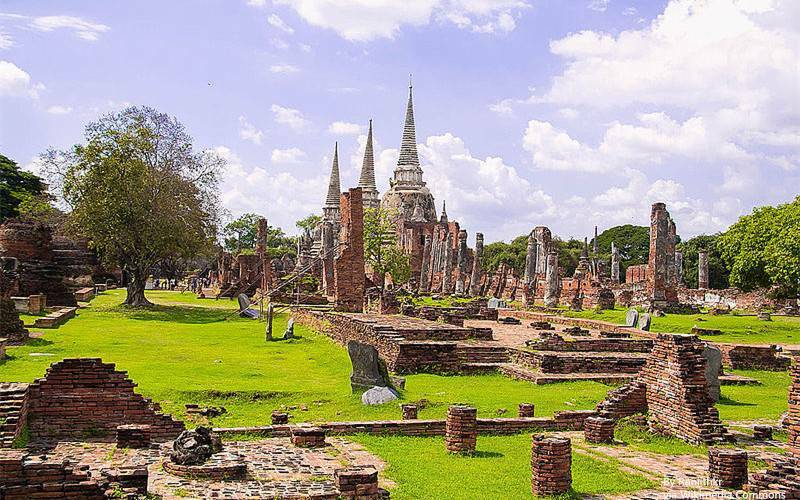 Walking straight through the park points to Ayutthaya Historical Park and Wat Phra Si Sanphet, restored ruins of an ancient royal temple. 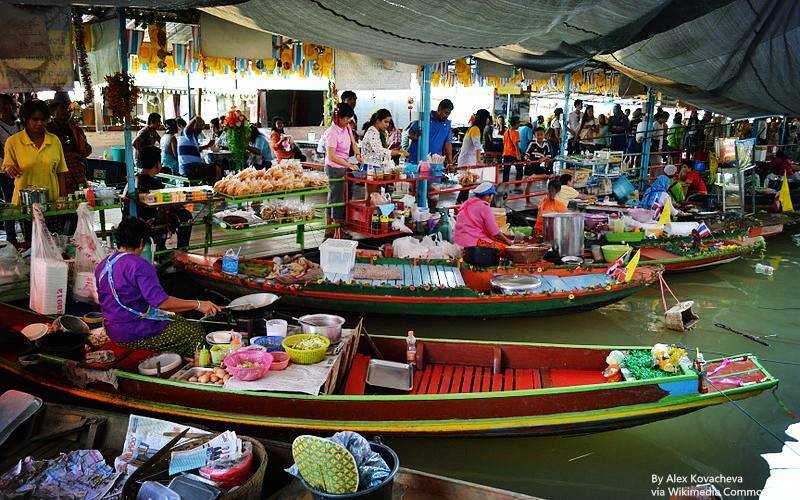 Another floating market exists in Ayutthaya. Though, the floating market now required overseas tourists to buy an entrance ticket for just 200 baht.